Uncategories Arm Me With Carry, Conte Drop A Load On 'Em...BTP, How Can I Explain It? Arm Me With Carry, Conte Drop A Load On 'Em...BTP, How Can I Explain It? 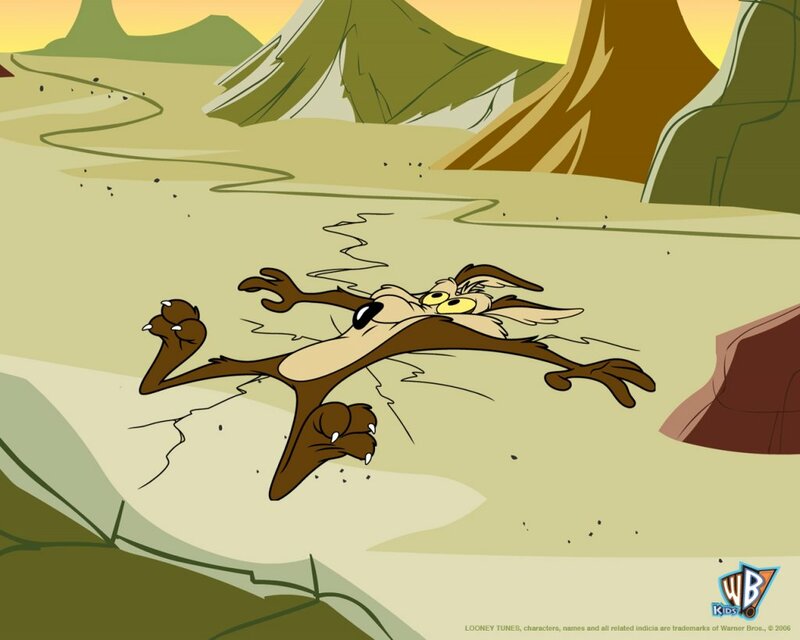 With Italian debt markets feeling an awful lot like everyone's old friend Wile E. Coyote after a bad run in with The Market Formerly Known As The Roadrunner, the old saws are at it again: of course lending money at negative rates to Italy of all places was going to go poorly! Just like that century bond in Argentina was such a bad idea. 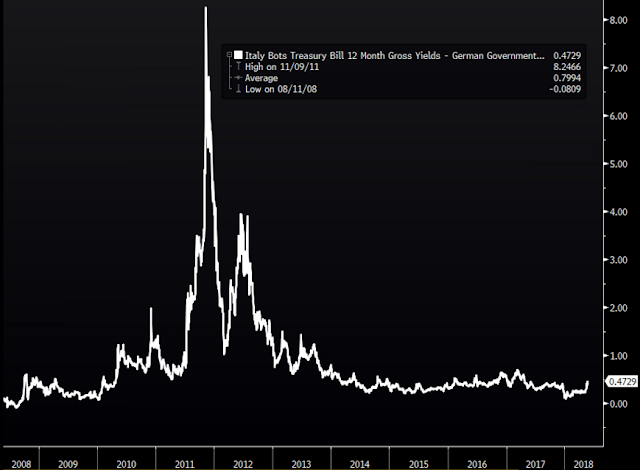 Similar to the century bond claims, which have been given good treatment by others, including TMM's Shawn, context is absolutely necessary for the case of Italian debt spreads. First off, let's keep in mind that even with a serious rough patch in 2011 and the mother of all duration rallies in all things safe and EUR-denominated since, BTP futures have outeperformed bunds since inception. 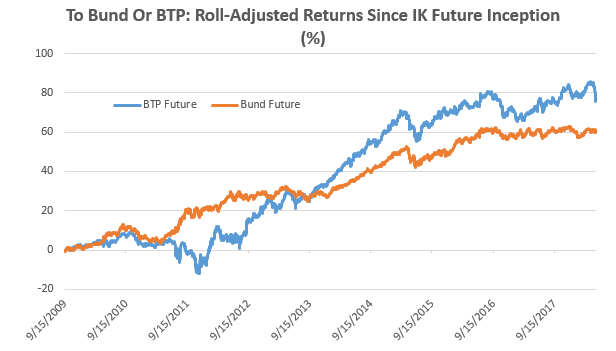 In the chart below, we show the relative performance of IK futures (~10y BTPs, currently IKM8) versus bund futures, since the inception of the IK futures. For the record, these two contracts' duration has always been within 5% of each other with a median of 36 bps difference since inception. So we don't need to worry much about adjusting for duration to get a like-for-like comparison of rate risk. We also have availed ourselves of Bloomberg's roll-adjustment feature to make sure that roll yield and CTD differences are all sorted out. Now, granted, there have been some excellent directional trading opportunities for the spread. 2011 is a good example, as was the peripheral widening of 2016 when markets digested Brexit and the risk of French elections gearing up. 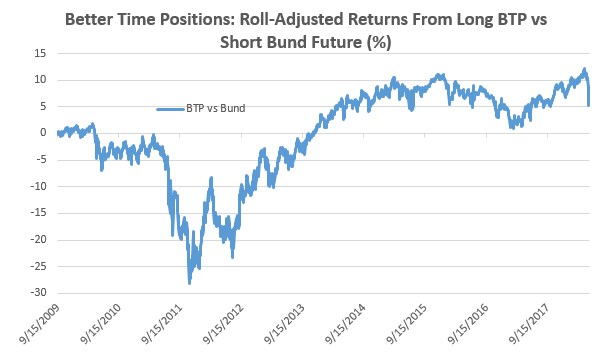 But all-told, you've earned 5% simply owning BTPs and shorting bunds via futures. And that includes the most recent move. Of course, that doesn't include the embedded leverage (roughly 29:1 on BTPs and 71:1 on bunds based on straight-up initial margins for both). But the key thing is, even with the huge drawdowns of the Eurzone crisis, BTPs have been a great bet for the past half decade by and large. We can also take duration right out of it. 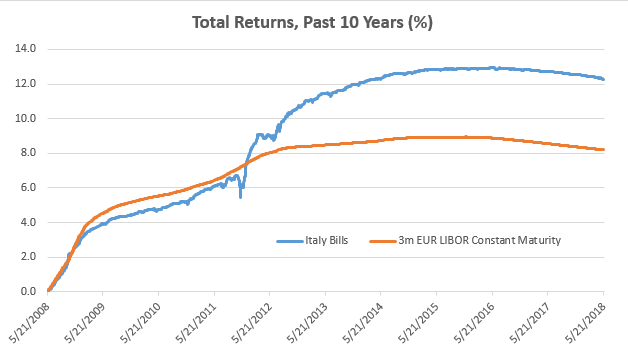 Below we show the total returns over the last 10 years for two series: the market-value weighted Italian bill index (BoTs) and returns for constant-maturity EUR LIBOR. Again: outperformance. Skeptics will, fairly or unfairly, note that the 8% spread over bunds for 12 month BoTs back in 2011 give one heck of a tailwind for returns here. They've probably got a point. To mollify the starting point crowd, here's the same chart started on the last day of 2013, when spreads had sunk into their contemporary range. Again: outperformance! 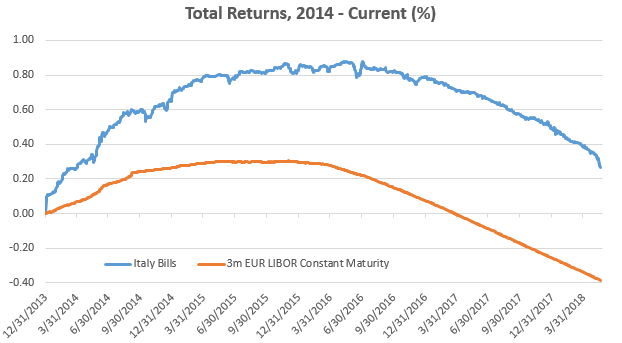 The answer to the question "how could you lend to Italy at negative yields" is therefore pretty plain. It's because risk premiums could only get so high, and with negative "risk free" (always a purely academic concept, but here meaning "least risky") yields elsewhere, either spreads had to be ludicrously high or nominal yields had to head below zero. Financial markets are always and everywhere a relative game, and as much as we love heuristics like "nominal yields should be positive", sometimes they don't work and there's nothing we can do about it. As it stands now, the move higher in BTP yields has been swift and frankly gnarly. 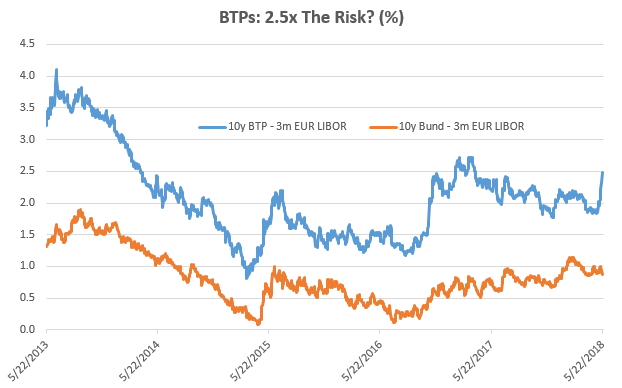 But when combining the extra risk of term with the extra risk of credit over prevalent short-term "risk free" (scare quotes again) rates, BTPs now carry 2.5x the premium that bunds do, and at a lower duration and lower convexity. With all of that said, the combination of rapid shock higher on pure expectation with relatively elevated risk premiums suggests to yours truly that things are primed for reversion. How the whole Italian curve trades is going to be very much dependent on how quickly Lega and the 5 Stars hear the screamed message of "y'all are out yo' damn minds" that markets are sending. With the ECB taking down 3.5bn EUR per month in Italian debt (and now holding as much as Italian banks do, give or take), a ~3% of GDP current account surplus, and broadly stable global credit markets with just-fine-thanks growth, Italy's self-inflicted mark-to-market wounds will heal quickly should the politicians decide to heed the message they're being sent. The question is, are Messrs Salvini, Di Maio, and Conte going to get the message? If not, will one of the two parties cry "uncle" and put a halt to the bold experiment in Italian populism, or at least enough to signal that Wile E put on the breaks in advance of the cliff? Given that nobody has even introduced any legislation yet, let alone sat down across from the people that drove Our Man Varoufakis into the pages of Paris Match, there's now room to eye the risk premiums in BTPs and BoTs more jealously. 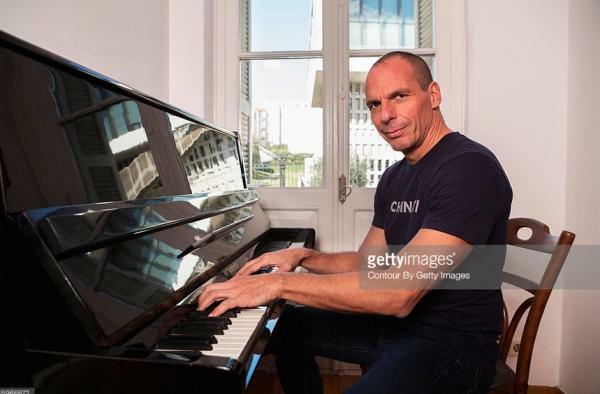 Now, play us off, will you Yanis? We know you're down with BTP. The carry trade is over ..walked away from picking up pennies in front of steamrollers. But be my guest....dream on all you like fellas! The volatility dampening going on right now is really something to behold. Back in February gaps down like we had this morning would have led to continuing falls. Today? Every time any type of momentum even starts to build towards the downside, the market hits rapid breaks and the dip-buying resumes. Late June is going to be very interesting. Long holiday weekend beckoning but the pain isn't over for the bond shorts. Yields still falling this morning… also keeping an eye on the continued slow retreat in crude oil. @Cbus - vol does seem likely to be restrained for a while, I guess you'd argue this continues until buybacks are over. @LB, yeah, that's essentially my thought, but we'll see. You can simply look at how much vol dropped this quarter once share buybacks took hold, it's pretty impressive. No surprise either considering the sheer volume of buybacks. If the June 15-early July period coincides with other market issues (such as rising bonds as an example), I think volatility will get really interesting. As for bonds, they're dropping right now, but they'll probably shoot up on may 30th as the largest sale of the year is coming. Good opportunity to add to shorts right now in my opinion. Bond shorts still getting rear-ended here today, although the worst may be over for them now - a lot of the short covering is being driven by the eye-watering meltdown in crude oil (and breakevens, i.e. inflation expectations) after the OPEC noises about production targets. No contagion into the broad US equity market, and the lack of vol is remarkable, as @Cbus noted above. By "May 30th", I take it that @Cbus means the large scheduled reduction in the Fed balance sheet, not Treasury auctions. One might expect that to be felt in both US fixed income and equities on Tuesday and Wednesday next week. During the last sell-off of the long bond into the 116s, we targeted the gaps to 118.60 and 119.23, which have both filled, and we have exited. The next one would be to 120.30, which would probably serve as a good stop for anyone thinking about shorting. This is going to be a tricky trade to execute, b/c markets are closed 5/29, and we are very unwilling to short anything into a long holiday weekend, (especially Treasuries given the recent rumblings in Italy, Spain etc..). We hear the idea but would rather sit on our hands and cash and enjoy the barbecues. If we see a continued dropoff in oil, things will also get rather interesting from the perspective how how long everyone is on the inflation narrative. I figured Oil would fall back down to earth at some point, but I wasn't thinking it would start this soon (although that's still yet to be confirmed). I like the idea of buying into airlines right now as a way to trade a potential drop in oil prices. Similarly, if oil cools off this summer in any type of sustained trend then we'll likely see a bid for long dated bonds, which could get us close to inverting the yield curve. In this situation, I like a rotation into defensives & bond proxies as well. REIT's and defensives in 2018 have performed really well when we've seen flattening, and really poorly when we've seen steepening. Financials have been the opposite. I think it was early 2011--I went back to my university to give a breezy speech to the international finance class and visited an insurance company on the way home. Their head of EMEA rates said to me, "These guys in Greece. They're not going to pay. Maybe someone else will, but they're not." By the time I got home 5y greek cds hit 400bps. A EU sovereign credit at 400! It was preposterous. Right now I think it is equally preposterous that Italy could go down the chute. But again recalling the beginning of the Greek crisis--it wasn't just that they spent too much money--the corrupt old government did a rather brilliant job of covering their tracks (thanks, Goldman!). When the new government took over and pulled back the curtain on the nasty sinkhole in the government's finances, it was all anyone could do to keep the plates spinning as long as possible. Italy has a ton of advantages that Greece never did, and never will. Not unlike much of EM at these levels, I'm also inclined to take the other side here but at these yields it doesn't take much of the unexpected to turn a total return winner into a stinker. Not quite a roach motel, but a stinker. I suppose a bigger question worth asking regarding the Eurozone is what has materially happened since the last Eurozone crisis to make things better? As I understand it, the ECB stepped in during the Eurozone crisis to stop the bleeding through their QE programs. That's great and all, but has an actual recovery happened along with necessary austerity and risk reduction, or did ECB's QE programs just procrastinate what was always going to happen? QE can be good in the sense that it can give companies liquidity and the time they need to get their problems worked out. But that's only IF those things get worked out. I tend to get the impression the european QE programs simply created a ton of zombies that haven't really changed fundamentally from the days of the crisis. Am I wrong on this, or have things in fact remained very similar (or possibly even worse due to imbalances) since the start of the PIIGS started having their problems. would itilians really want to leave when the ez economy is doing well. It doesnt seem like the smartest thing to do, but I have no idea who the politicians think. Isnt it just another carrry trade rolling off? I dont see Euro CoCo's doing much, perhaps I havent watched the right ones. Eurostoxx bank prices are in gutter but I attributed that to lower bunds, though I havent been following so close. nico you back. Wow I have been away too long. Crappy about that short last year. Though year to short synchronized global growth. Have you seen SWIFTY around the bloomberg shop floors lately? I hear those dollar bills getting around the bloomberg floor are getting more moldy each week..that stack down in basement is getting bigger by the day. "So, did equities peak in January and are we now headed for a recession and a bear market? Probably not. Unemployment claims hit a 49 year low in mid-May; the yield curve is still 50 bp away from inversion; new home sales are close to (but below) their expansion high made 5 months ago; and the LEI made a new high in April. All of this implies that the SPX is likely to exceed its January high in the months ahead." Unemployment is a lagging indicator. The yield curve is being heavily influenced by a lot of the stuff going on in the bond world which isn't normal, and this all ignores the fact that most of the risk in markets right now is centered outside USA borders. I tend to think that the next USA recession will be one of the first that will be led by recessions outside the USA border. Typically it's the other way around, but if the global economy slows down enough, then that will eventually have an effect on the domestic economy. We saw this happen in 2015 before Europe and China flooded the world with enormous amounts of easing. But we'll see how things play out. I definitely do think domestic USA markets are one of the better places to be right now however. Most gambling games Gclub Casino are available in multiple versions. Some versions are better than others. A good example is roulette.